Our client was running out of room for their growing staff and needed a new space with additional room for hosting celebrity visits. 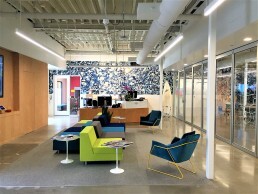 Their new office, located in the Playa Vista neighborhood of L.A. locally referred to as ͞Silicon Beach, contains flexible studio space that provides a blank canvas for studio designers to create new and exciting sets. Our team also facilitated the installation of a paper and glitter art piece that hangs down from the ceiling of the second floor through to the bottom of the first floor, which adds a unique bit of character for employees to enjoy.